Every July 4 in Coney Island, Nathan's holds its famous hot dog eating contest. 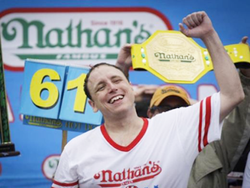 For the eighth straight year, the winner was Joey Chestnut, who this time ate 61 hot dogs in 10 minutes. With live coverage by ESPN and various other media exposure, the event clearly grabs public attention. Some question, however, whether an eating competition is appropriate in a nation plagued by obesity and in a world in which many people are hungry.